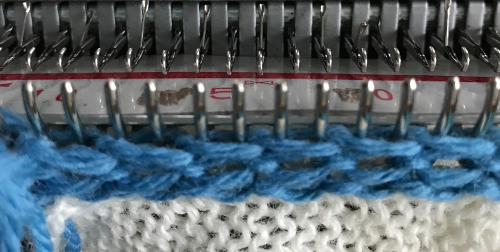 There are a group of single bed braids/edgings following horizontal chains produced on the knitting machine that have reminded me of crochet. 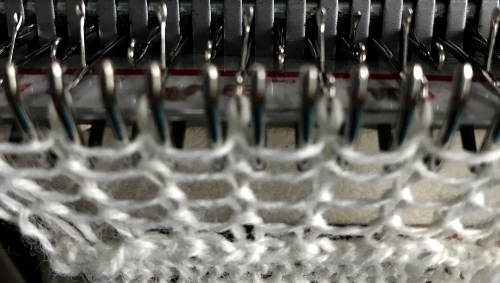 They are based on frequent latch tool bind offs that occur with the fabric facing either side as it is regularly removed from the knitting machine. 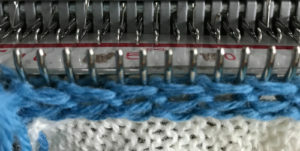 The bind offs by necessity will move in either or both directions, since a continuous yarn strand may be used unless one chooses to change colors. 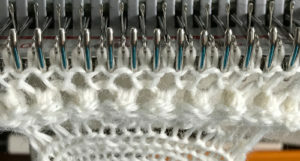 The bound off edge is rehung and worked further. 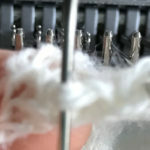 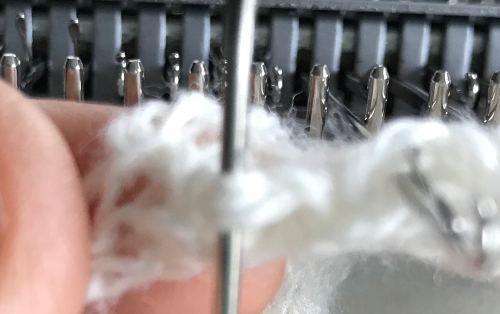 It is a great way to get proficient at the technique, or to get some use from that linker that has been in storage (providing a loose enough tension producing big enough stitches for it to work smoothly may be used). 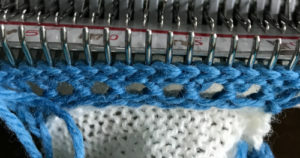 For the purposes of this discussion, this illustration of a crochet chain shows places where the hook might be inserted and exit before picking up yarn to create the next stitch with a hook. I think of rear and front loops illustrated as creating a “chain”, and the one in the rear as a “bump”. 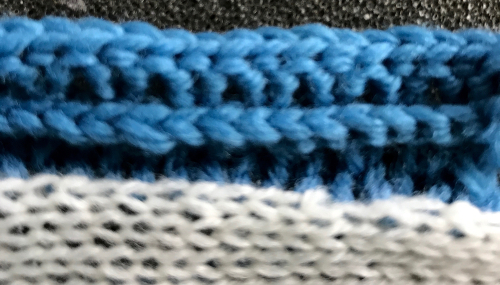 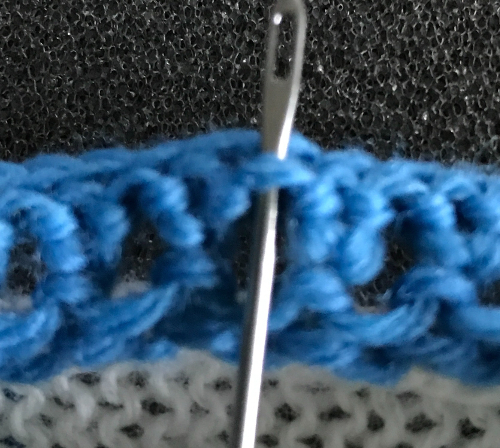 To keep the number of stitches constant for straight edge on both sides of piece, the loop at the end gets its own needle. 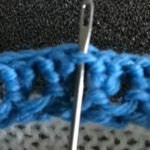 A sample created picking up rear loop only, without turning the work over at any time. View of side 1 and loop consistently worked. 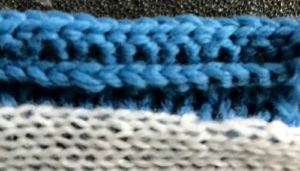 Note the slight bias in fabric, due to its being worked always in the same direction. 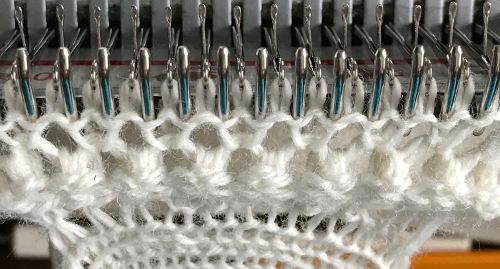 Turning the work over would eliminate the problem, in a similar way as transferring eyelets in opposite directions achieves that in lace. 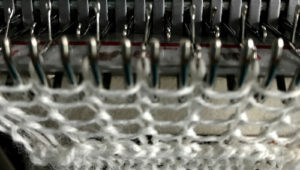 reverse side is usually the one facing away from the knitter. 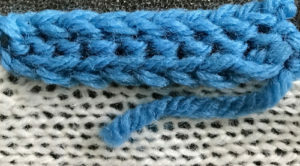 That is a consideration in planning the look of the trims, depending on whether the body of the piece is to use the purl or knit side as the “public” one.